First, however, we had to get there. We pulled it up on our GPS and headed off.  We had arrived said the app and we had…well kind of. We were at the foot of the Croagh Patrick but, unfortunately, we were on the backside of the mountain. The GPS had taken us to a peat farm. A man shoveling peat on the side of the road certainly seemed amused at us trying to turn around on the tiny road. With our slight detour over with, we arrived at the Croagh Patrick parking lot. The trail is difficult almost from its outset, more of an exercise in continuing to trudge on despite being exhausted. Forty-five minutes into steep hiking up, the trail leveled off, if only just briefly. These 10 or so minutes of flat walking were a lifesaver. Then came the truly hard part, the trail took a sharp turn up the mountain. The climb up was difficult less so because of how steep it was and more so because the “trail” was a bunch of large rocks on top of each other. There were a few points where the rocks had cleared away and you were scrambling up the dirt path. For the most part, though, you’re walking on top of layers upon layers of rocks larger than my foot. With almost every step, you slide backward. Never have I felt the adage, two steps forward one step back more. This constant slide made the trail that much more exhausting. We kept scrambling and climbing. With each person, we passed they would say, “Just a little further now”. I believe I heard that same phrase at least a dozen times. Finally, we could see the top though. We had made it! 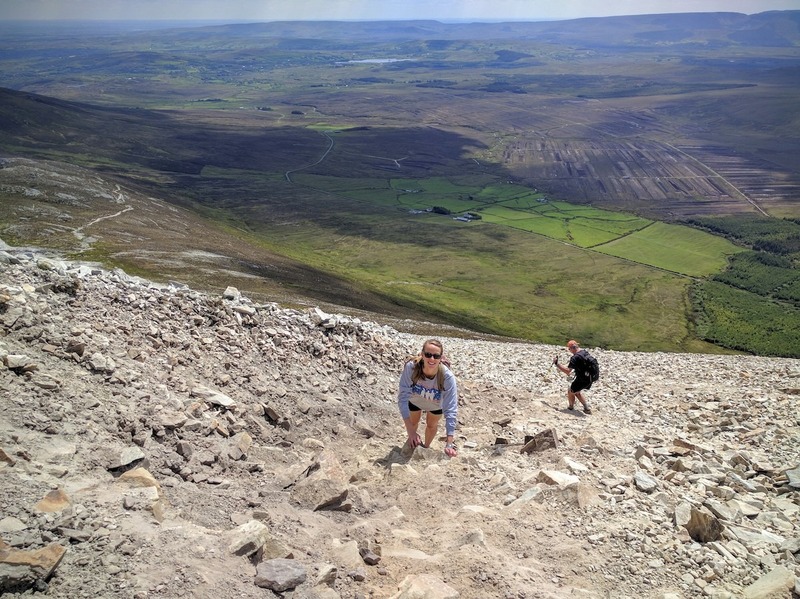 Now at the top of the Croagh Patrick, we enjoyed the stunning views surrounding area. Mountains to the south, a large bay to the north, the view was 100% worth it. We walked back and forth from one side of the summit to the other. At the top of the mountain, there is also St. Patrick’s Chapel. A small chapel, though when you consider where it is it’s quite large. This chapel, built in 1905, was placed on the foundation of a where a chapel had once stood since the 5th century. 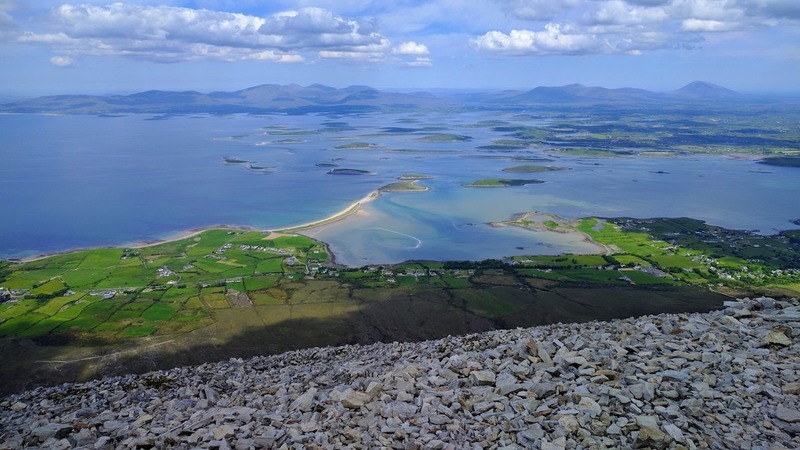 Though, apparently, they didn’t know that until an archaeological excavation in 1994 found the remains of a foundation at the summit of the Croagh Patrick. 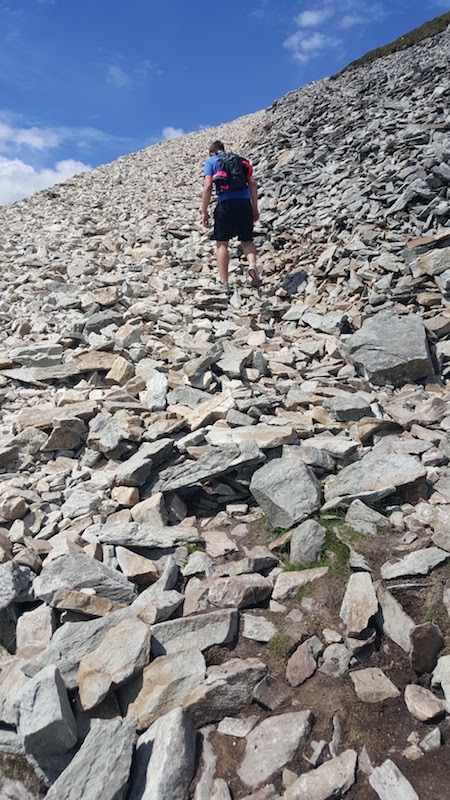 The climb down the mountain was…a tad scary at points to be honest. As you took a step, the rocks would slide beneath you. I never felt like I would go tumbling down the mountain, just more an uneasy feeling of not having a sure footing. Thankfully, neither of us fell. I almost did, I took a step and the rock below my foot just kept sliding. Finally, it came to a settling point after a few feet and I was able to catch myself. I couldn’t believe how many people were essentially jogging down the mountain. I’m not sure what gave them that level of confidence but I definitely didn’t possess it. Even though we escaped injury during the part of the hike where you’re sliding down rocks we didn’t fully get away unscathed. With less than 5 minutes to go until we reached the bottom, I hopped from one large stone onto a boulder. The boulder had a fine layer of sand which caused my left foot to slide across the top like I was on a sheet of ice. My trailing foot smacked into the side of the boulder with such force that it bruised the pad of my foot. Though, when I think about it, it could have been a lot worse. I could have easily torn something in my knee, for instance. After reaching the bottom, we looked back at the mountain we had climbed feeling accomplished…and exhausted. However, there was one more stop in our day. We drove out to the Our Lady of Knock Shrine in Knock, about an hour east of the Croagh Patrick. This pilgrimage site is the location where, starting the evening of 21st August, 1879 when, fifteen people from the village of Knock, witnessed an Apparition of Our Lady Mary the mother of Jesus, St. Joseph, St. John the Evangelist, a Lamb, and a cross on an altar at the gable wall of the Parish Church. The witnesses watched the Apparition in the pouring rain for two hours, reciting the Rosary. Although they themselves were saturated not a single drop of rain fell on the gable or vision. There were fifteen official witnesses to the Apparition, most of whom were from the village of Knock and surrounding areas and ranged in age from just 5 years old to 74 years old. Each of the witnesses gave testimonies to a Commission of Enquiry in October 1879. The findings of the Commission were that the testimonies were both trustworthy and satisfactory. 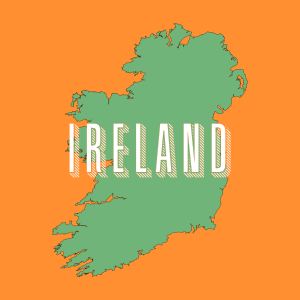 Because of this, it is now a popular site for Catholic pilgrims to visit while in Ireland. After spending a few hours there, the rest of our evening was spent walking the charming Westport, exploring shops and walking along the river. Being much too tired to go back out for a pint and to listen to music, we headed back to the house and fell asleep almost the same time the sunset. 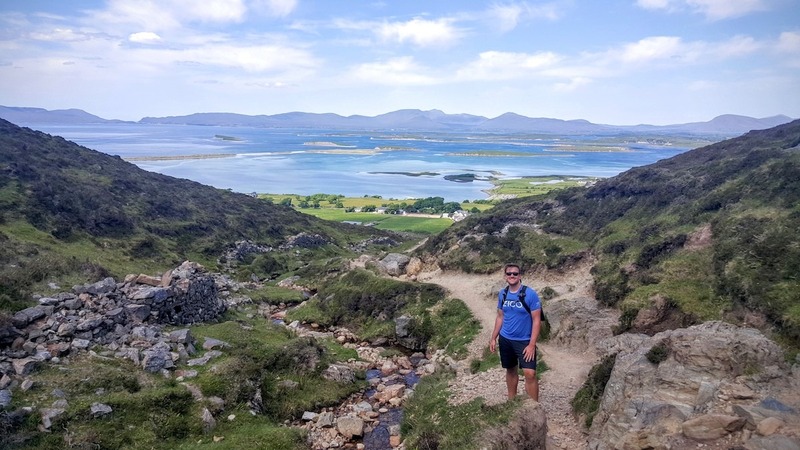 I have done few things as draining as hiking the Croagh Patrick. It’s incredibly exhausting, however, there is a way to make it even harder. 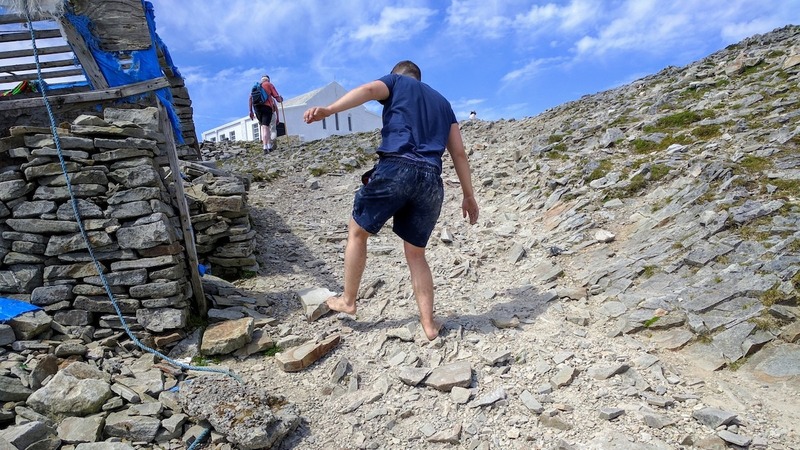 We only saw one man climbing the Croagh Patrick barefoot. However, we have heard that many do so as a self-inflicted penance, especially during Lent or St. Patrick’s Day (clearly a different celebration than in America).